Uncoated paper, coated paper, vellum, photo, leather(tanned leather), cellophane unpainted wood, polymer clay, shrink plastic, terracotta. High opacity ink works wonderfully on dark paper! Ink (from inker) is easy to spread and can be used as paint. Ink can also be mixed into clay. Use ink with the Squeegee or Sponge Daubers to create different background effects.Re-ink the pad (with inker, sold separately) as needed to keep pad moist. Do not allow pad to dry out completely. Innovative shape is easy to hold at any angle. The density and shape of the pad make the Dew Drop ideal for DTP (direct to paper) techniques. Pointed edge makes it easy to apply multiple colours to one stamp. Use the pointed and broad edges to make different designs when applied directly on the paper. Side colour indicator label makes it easy to find colours when pads are stacked. Perfect size for storing and carrying multiple colours. Also sold in colour coordinated packs of 4. 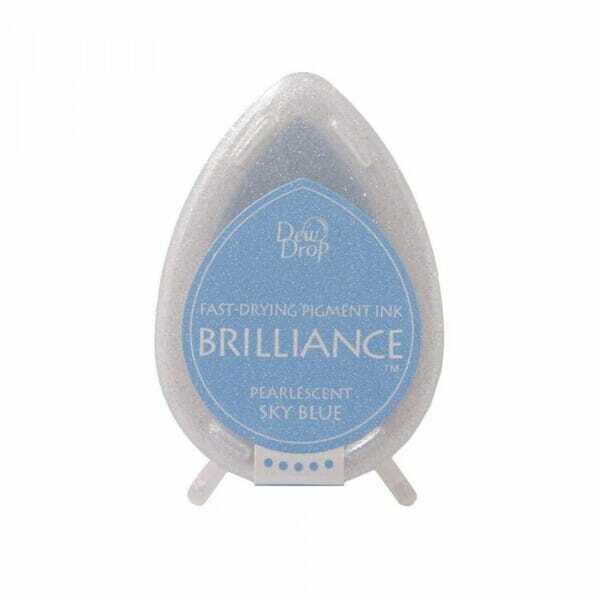 Customer evaluation for "Tsukineko - Pearl Sky Blue Brilliance Dew Drop Ink Pad"